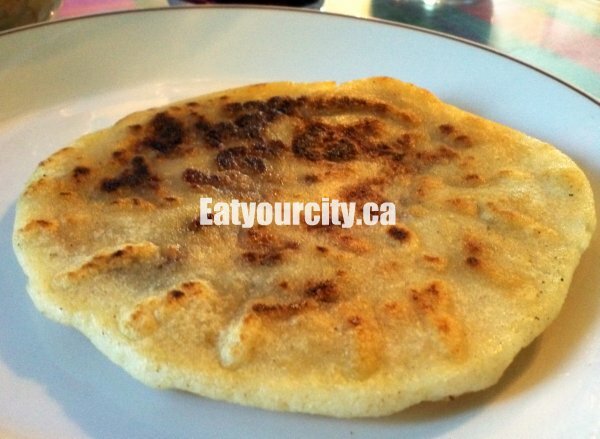 Eat Your City: Acajutla Restaurant Edmonton, AB - Wicked awesome pupusas! 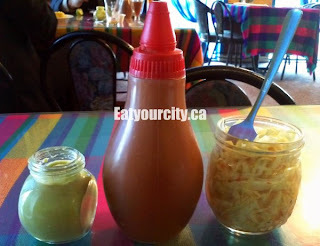 Acajutla Restaurant Edmonton, AB - Wicked awesome pupusas! 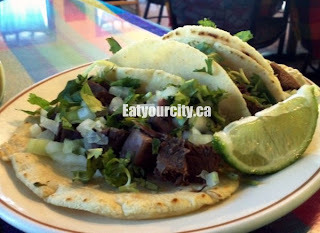 We first experienced Acajutla a few years ago when our Elsalvordian friend brought us here to try beef tongue dishes! 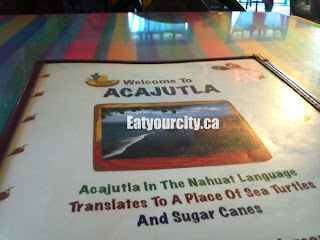 Craving super yummy Elsavadorian pupusas, my boyfriend was not disappointed at Acajutla (we've been to El Rancho many times, so we have to give other restaurants a try!) 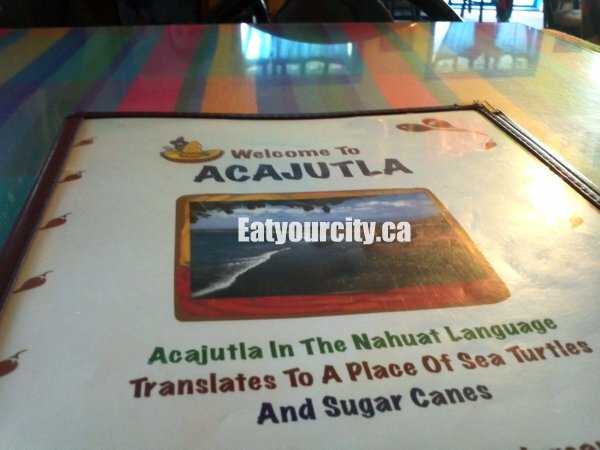 Named for a seaport in El Salvador (a place of sea turtles and sugar canes), this quaint and colorful restaurant was bustling during lunchhour. With tummies a growling, my boyfriend perused through the menu, gawked at the rainbow colored tablecloths and bright sunshine yellow walls. Service was friendly, and the kitchen was a bit slow, but as its a family run restaurant, we know good food takes time, and the wait was well worth the pupusas! A small selection of non-alcoholic drinks a freshly squeezed juice cocktail was available. 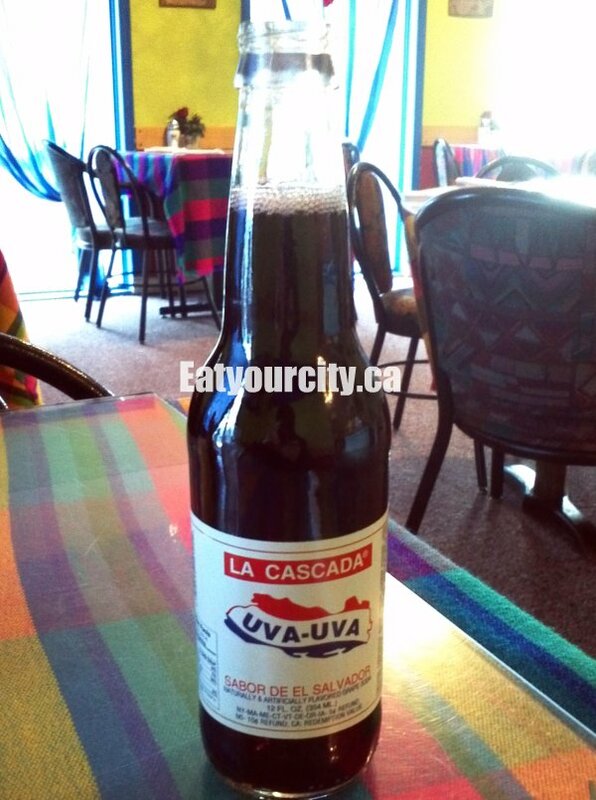 They didn't have our favourite flavor of Salvadoran cream soda (Cola Champan), so we went with this creamy grape soda instead. It tasted like diluted purple Crush lol! Starting off with a Mixed pupusas - grilled to a finger scorching hotness, these made in house fluffy corn tortillas are stuffed full of chicaron (seasoned pork ground into a smooth pâté) and a ridiculous amount of ooey gooey molten mozzarella cheese. My boyfriend enjoyed Acajutla's pupusas better than El Rancho mainly because there was much more cheese hidden in these little tasty packages. 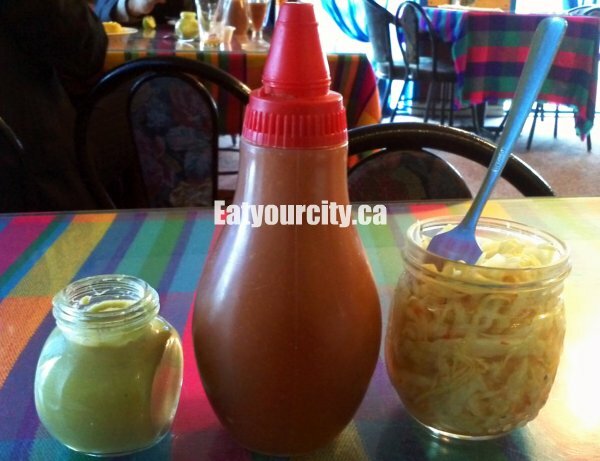 Rather than serve the pupusas with a side of pickled cabbage slaw as they do at El Rancho, the toppings are set off to the side on the table, so you can top off any of your dishes with spoonfuls of crisp tangy cabbage slaw, salsa and or creamy verdant green avocado sauce whenever you like. While not as flavorful as we expected it to be, since there was unlimited tangy cabbage slaw, my boyfriend polished off nearly the entire jar by himself lol! 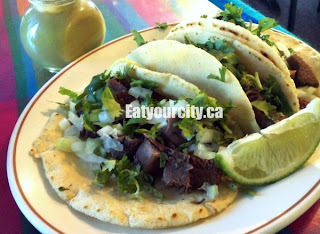 With the anticuchos (beef hearts) only being a special now and then, we went with the beef tongue tacos instead. With large chunks of lightly seasoned well done springy yet very tender chunks of meat, lots of diced sweet white onions and torn cilantro leaves, we felt we needed to dress it up with the cabbage slaw and salsa, as it didn't stand well on its own. Once you dressed it up, it was quite tasty and very filling. Amazing pupusas, and we're definitely have return for dinner sometime so we can try a larger selection of their menu... including their desserts! !